Our trip started with three fairly long days of driving across country from Durham to Canon City, Colorado. The drive crossed several states on the Interstate Highway system. Long trips like this really make you appreciate the interstate system and the 65 to 75 mile per hour speed limit. I've driven across country before the interstate system was completed and remember having to wait behind trucks going uphill at 10 mph and going through every town between. But that we easier than the trip that my grandparents made in covered wagon and on horseback to help settle Colorado. A car trip across the US, even at interstate highway speeds, gives me a renewed appreciation of the country. The wide variety of the country never ceases to amaze me. We went from the gentle hills and green of the Piedmont region of North Carolina, through the mountains of North Carolina, Virginia, and West Virginia, Then on through the prairie of Indiana, Missouri, Kansas, and Eastern Colorado. Black soil and beautiful farms. Trees become fewer and fewer as you head west. Then we hit the Rockies and discover trees again. After the Rockies, we begin the descent into the great American desert where annual rainfall is less than 10 inches. The dominant color becomes red. 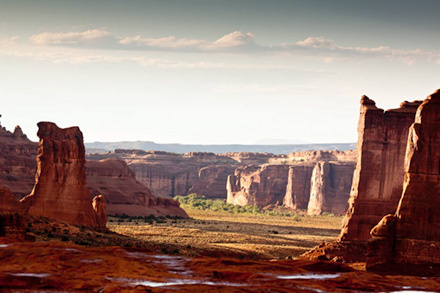 The scenery is dominated by the erosion of red sandstone. Then there are the wonderful places that our parents and grandparents have preserved for us as national and state parks and monuments. All the places we visited were beautiful and amazing in their own way. And preserving them for us was not an easy fight. The words and pictures that follow don't do justice to the places. I hope that you will visit these special places. We spent nearly a month visiting in Colorado, Utah, and Arizona, put nearly 6,700 miles on our minivan, and still didn't have as much time as we wanted. Our first real stop was in Canon City, Colorado. 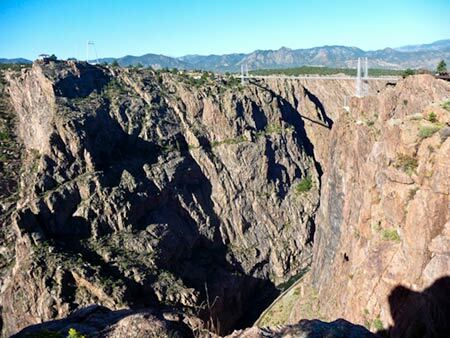 From Canon City, we planned to drive to the Royal Gorge (a place I remember from childhood many many years ago) and then head onto the Black Canyon of The Gunnison National Park. The motel we stayed at must have been headquarters for many of the movies that were made in this part of Colorado. 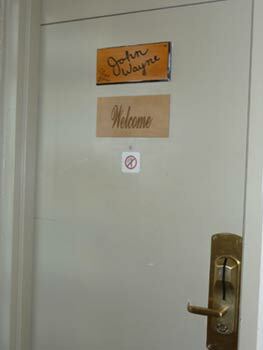 Many of the rooms had plaques saying who had slept there. Lots of movie stars including John Wayne and Goldie Hawn. We stopped at the Royal Gorge in Colorado for a brief look. The place has become more or less a theme park so we didn't spend much time there. The huge gorge that the Arkansas River has dug here was well worth the stop. After our brief visit to the Royal Gorge, we headed for Monarch Pass. We stopped to take picture of the mine near the summit. 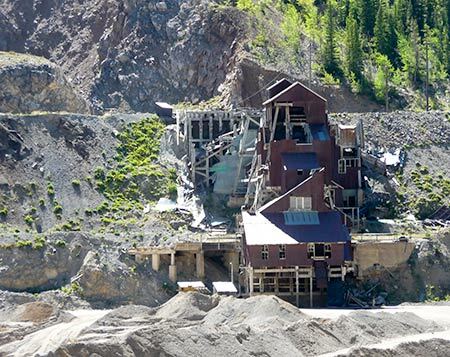 We tried to find more information about the mine, but didn't have any success. We stopped at the summit to take the Monarch Crest gondola ride. 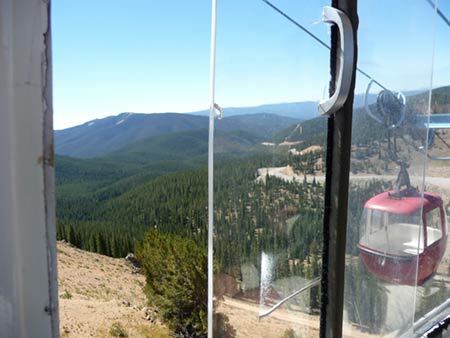 The gondola takes you to the Monarch Summit parking lot, 11,312 feet, to the Monarch Crest at over 12,000 feet. The day we were there the wind was high and the temperatures low so we couldn't get out of the hut at end of the ride. The view was spectacular even though we had to look through the Plexiglas windows. Would love to go back when the weather was a bit better. After leaving Monarch Pass, we headed to the Black Canyon of the Gunnison. We had most of the afternoon to visit the south rim and most of the next day to visit the north rim. From there we made a quick visit through the Colorado National Monument. We spent the night in Fruita, Colorado and then headed to Utah where we visited many of the National Parks and Monuments there. From Fruita, Colorado we headed west across Utah to Capital Reef. Check the Southwest Trip Menu for all the places we visited. Thanks for visiting. 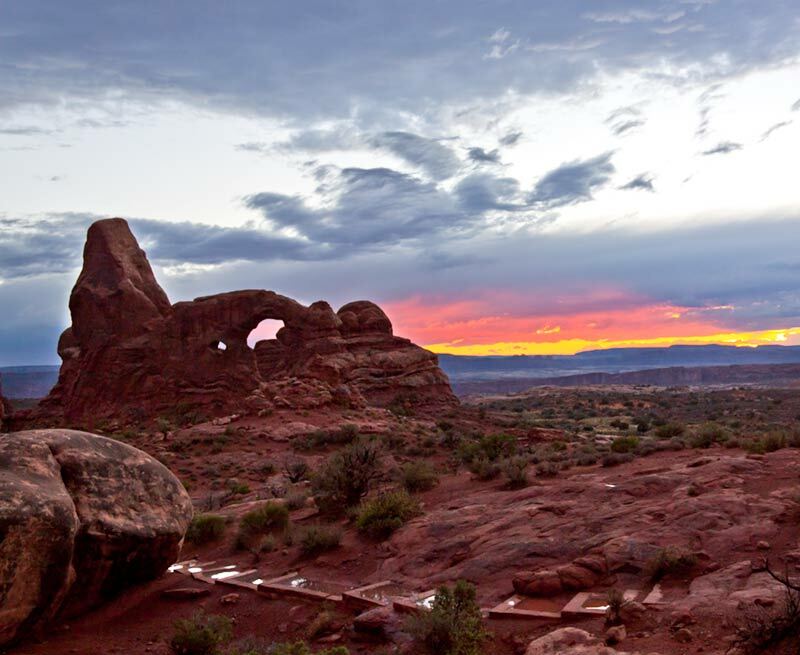 Be sure to visit some of these special places on your own. Travels with Nessie Home :: Site Map:: Contact webmaster@ncsparks.com-email us:: Copyright Leslie Sparks 2006, 2007, 2008, 2009, 2010, 2011, 2012,2013,2019:: Last modified: May 20 2013.